This unusual acanthus relative grows to about 3' tall and wide. 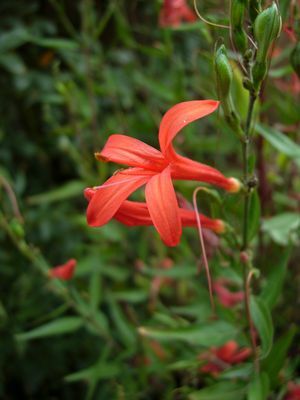 It produces incredibly bright red flowers from late July to September that are a magnet for hummingbirds. Desert honeysuckle goes winter dormant. It prefers well-drained, lean soils with little compost. It's really drought tolerant once established. It's also really low-maintenance, needing just a little bit of occasional pruning to maintain a nice bushy shape, and is really frost tolerant, handling temperatures down to 5°F. 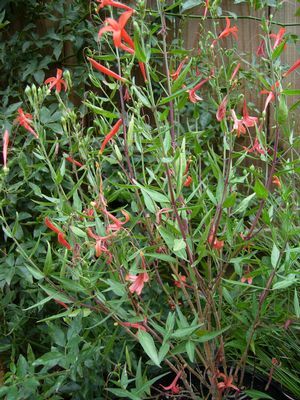 Desert honeysuckle is native to the Texas panhandle.